Google and Facebook are two of the biggest names out there. Nowadays mostly everyone has a personal Facebook account, and Google has the answers to everything we need to know in life. But when it comes to advertising for your business, which one is more beneficial? First off, let’s talk about Google. As the world’s largest search engine, it goes without saying that Google is very influential. For example, if we forget the title of a movie, we can search the name of the actors we remember from it or descriptors that would lead to the correct search result. We are able to do this because Google is based off of ‘keywords.’ Keywords in Google pull up recent information relevant to what you are looking for. If you or your company is looking to enhance your SEO, Google AdWords might be the better option. In this case, you can advertise in the form of sidebars, videos, banners and more! Video ads can be re-targeted towards YouTube, and retail ads can be utilized on the Google shopping page. On Google, people want answers fast. If your service can easily be summed up with a keyword, utilize Google AdWords to optimize your company’s customer base. Facebook, on the other hand, is more so used to spark curiosity in a product, brand or service. The big difference is that Facebook allows audience customization. Whether it’s age, gender, race or proximity, you can narrow or broaden your audience however you’d like. You really can’t go wrong with Facebook advertising. One way or another, professionally or personally, everyone is on or has been exposed to a Facebook news feed throughout their day. Your ad dollars will not go unnoticed. It’s also a great way for advertising if you are on a budget! The minimum ad spend is $1 a day! And, you can customize the time frame for which you would like your ad to run. 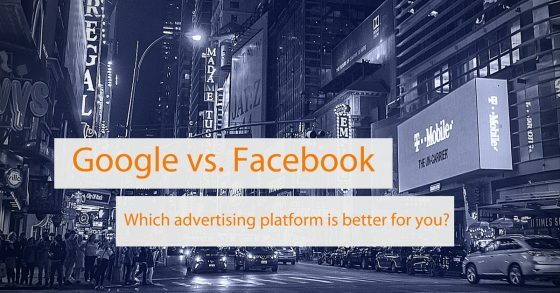 Whether it’s Google or Facebook, the advertising outcomes will not disappoint. Depending on the size and success of your business, it may even be beneficial to do a test-run of both! See which one works better for your company’s standards. If your company can afford to run ads on both platforms, try it. Your goals are ultimately the deciding factors of which platform is better. If you are looking to increase sales or provide more services within a certain amount of time, both platforms are beneficial. However, if you want to focus more on building brand awareness or increasing social engagement, Facebook is right for you. If you are looking for more sales opportunities, both platforms will help accomplish this. Here is the infographic comparing the two. Enjoy!